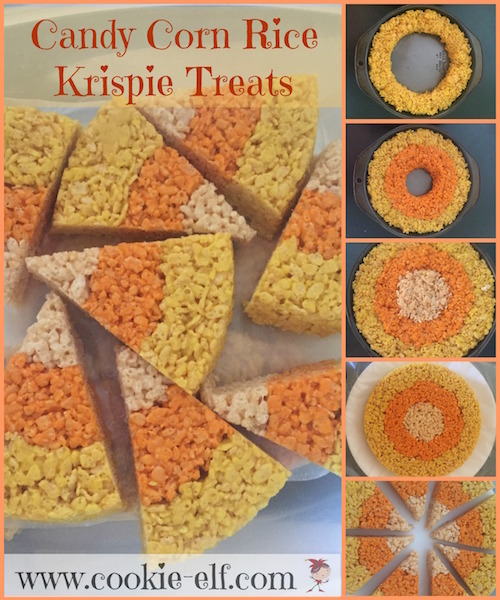 Traditional Rice Krispie Treats get a festive update in this Candy Corn Halloween Rice Krispie Treat recipe. This recipe takes a bit more time to put together than the usual bar cookie version – but to be honest, what doesn’t? It calls for just 4 ingredients (crispy rice cereal, marshmallows, butter, and food coloring) in different proportions for each of three layers. You make each layer one at a time and press it into the pan in succession. Use non-stick vegetable spray to coat the insides of two 8 x 8 cake pans and the surfaces of 3 spoons (or spatulas). Make the outer yellow ring: combine 5 cups mini marshmallows and 3 tablespoons butter to a large, microwave-safe bowl. Microwave the mixture for about 3 minutes, stirring at 1 minute intervals. Meanwhile, measure 4 ½ cups cereal into another large bowl. Remove marshmallow mixture from microwave. Stir in 2-4 drops of yellow food coloring until the mixture is smooth and fully combined. Pour the mixture over the cereal. Use one of the spray-coated spoons (or spatulas) to stir the combination until all cereal grains are covered and the cereal is uniformly yellow. You can even work the mixture with your hands, like pie crust, to distribute color throughout. The mixture will be thick. Divide the mixture between the two cake pans. Moisten your hands and use them to create a ring about 1 ½ inches wide around the outside edges of the cake pans. Work quickly because the mixture is more difficult to mold as it cools. Make the inner orange ring: repeat the same process as for the yellow ring, but shorten the microwave time for the marshmallow mixture to 2 minutes, stirring at 45 second intervals. Proceed as for the yellow layer, creating an inner ring that leaves a 2-inch circle in the center. Make the white center: repeat the same process with the ingredients for the orange ring but shorten the microwave time for the marshmallow mixture to 1 ½ minutes, stirring at 30 second intervals. Use the heel of your hand to press the white center in the pan. Then press down all the layers across the surface of the pan so they stick well together. Allow the rounds to set for 30 minutes. Flip a pan onto a cutting board and tap it to release the round onto the cutting board. Use a long bread knife to cut the round first in half, then quarters, and each quarter in half. Repeat for the second cake pan. Store the treats in an airtight container with waxed paper in between layers. You can use liquid or gel food coloring. Don’t be afraid to use a few extra drops of coloring. Bright, deep colors create a strong contrast in the rings of the cookies. Dry the bowls thoroughly before making the next ring. You can insert a cookie stick or straw to rounded yellow edges to convert treats into cookie pops.